The next series of posts will present a selection of techniques developed to help our digitally-oriented clients visualize and present their design concepts in the early phases of a project, when there is neither time nor resources to execute detailed digital renderings. Simple, fast architectural sketches and renderings in pencil help you (and your clients) visualize your architectural concept designs prior to engaging full-blown digital architectrual renderings. Think of it as low-tech, highly cost-efficient art direction for the digital illustration age. 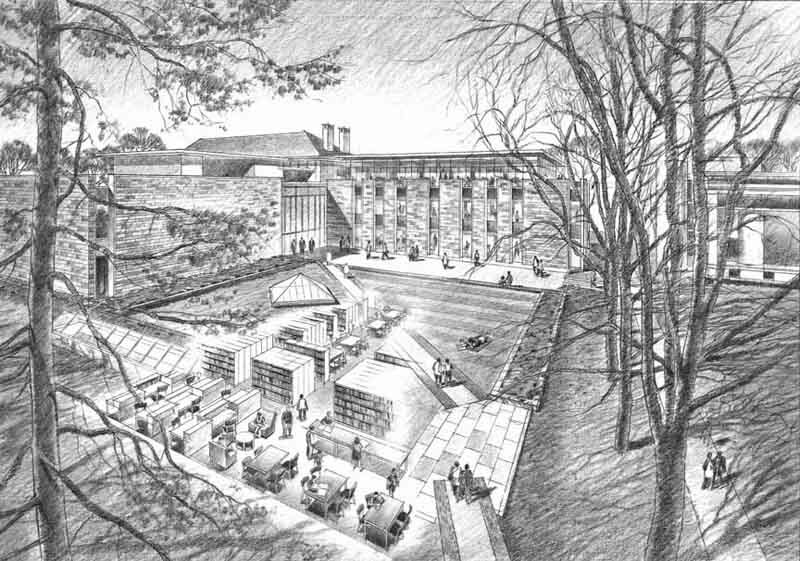 Above: This architectural sketch (or what some might call an architectural rendering) in pencil shows the architect's design concept for an underground book storage addition to the Princeton University library. Visualizing the design concept in quick pencil sketches not only engaged the client in an attention-grabbing and humanistic way, it also served as a kind of art direction to help guide the third party architectural digital renderers. Above: This architectural sketch (or what some might call an architectural rendering) in pencil shows the architect's design concept for a restaurant in the new MGM casino, Macau, China. Visualizing the design concept in quick pencil sketches not only engaged the client in an attention-grabbing and humanistic way, it also served as a kind of art direction to help guide the third party architectural digital renderers. 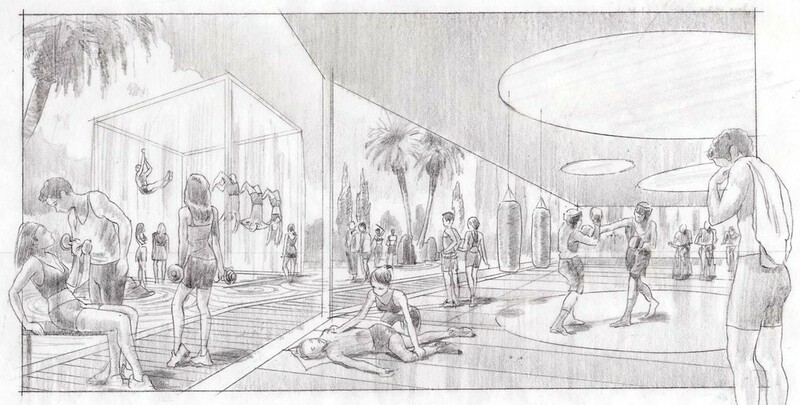 Above: This architectural sketch (or what some might call an architectural rendering) in pencil shows the architect's design concept for an aerial massage room in an Equinox gym proposed for NYC. Visualizing the design concept in quick pencil sketches not only engaged the client in an attention-grabbing and humanistic way, it also served as a kind of art direction to help guide the third party architectural digital renderers. Above: This architectural sketch (or what some might call an architectural rendering) in pencil shows the architect's design concept for a new wellness-oriented line of modular homes proposed for Carl Modular Homes. Visualizing the design concept in quick pencil sketches not only engaged the client in an attention-grabbing and humanistic way, it also served as a kind of art direction to help guide the third party architectural digital renderers. Above: This architectural sketch (or what some might call an architectural rendering) in pencil shows the architect's design concept for a new wellness-oriented line of modular homes proposed for Carl Modular Homes. Visualizing the design concept in quick pencil sketches not only engaged the client in an attention-grabbing and humanistic way, it also served as a kind of art direction to help guide the third party architectural digital renderers. Above: This architectural sketch (or what some might call an architectural rendering) in pencil shows the architect's design concept for a stretching room at a proposed Equinox gym. Visualizing the design concept in quick pencil sketches not only engaged the client in an attention-grabbing and humanistic way, it also served as a kind of art direction to help guide the third party architectural digital renderers. Above: This architectural sketch (or what some might call an architectural rendering) in pencil shows the architect's design concept for a new executive suite at Geffen Records. Visualizing the design concept in quick pencil sketches not only engaged the client in an attention-grabbing and humanistic way, it also served as a kind of art direction to help guide the third party architectural digital renderers. Above: This architectural sketch (or what some might call an architectural rendering) in pencil shows the architect's design concept for renovations to the lobby of an historic Park Ave. townhouse. Visualizing the design concept in quick pencil sketches not only engaged the client in an attention-grabbing and humanistic way, it also served as a kind of art direction to help guide the third party architectural digital renderers. During the concept design phase, before your design is ready for full-on digital rendering, quick architectural sketching services can help you charm your clients in less time and with fewer constraints than digital requires, so you can get back to doing what you love.